"The Wall" is a in-depth project that provides a visual representation of President Donald Trump’s mission to build a wall on the U.S.-Mexico border. 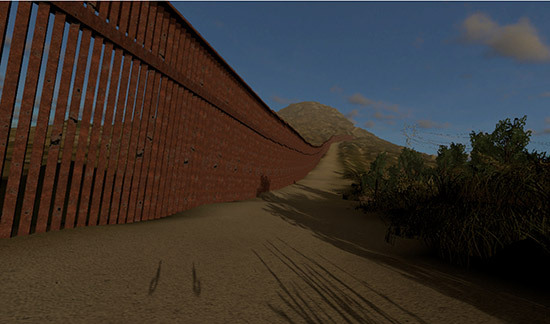 UAT Game Studios Program Champion Derric Clark selected students for the development team and created a special topics class called SPT 323: The Wall. 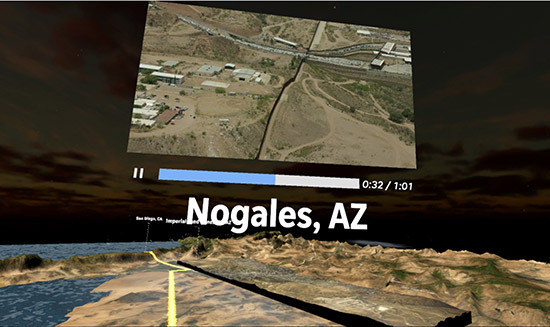 Acting as a supportive team, students created virtual reality (VR) worlds modeling LiDAR terrain data in the regions along 2,000 miles of the border between the United States and Mexico including California, Arizona, New Mexico and Texas. Initially, UAT's dev team conducted a great deal of research on the LiDAR terrain data of the regions. Then development began in Unity to create and then export the data into an interactive map for the HTC Vive. "This immersive experience encompasses virtual reality, bots, aerial and 360-degree video, documentaries, photos, podcasts, LiDAR data, exclusive reporting and an upcoming long-form film, bringing the stories of the region to life in a way never seen before," - USA Today. UAT students were responsible for were writing code for the VR worlds, programming in sound and video, designing the navigation, creating player functionality, and asset creation. Throughout the project, students remained unbiased and considered the experience from both perspectives - that of a Border Protection Officer and of the humans crossing the border. It was important to consider what the terrain would look like if the wall were to be built through a river, a mountain range and through residential areas. It was the students task to put this data in to a visual component to support a series of stories transcribed by USA Today reporters. Thanks to UAT students – Alex Gregory (game programmer), Todd Dickinson (game programmer), Mackinzey Lemley (artist), Chris Godina (game designer) and alumni Josh Milano (artist), as well as Professor Derric Clark for leading these students on this iconic project. For more information, visit The Wall.